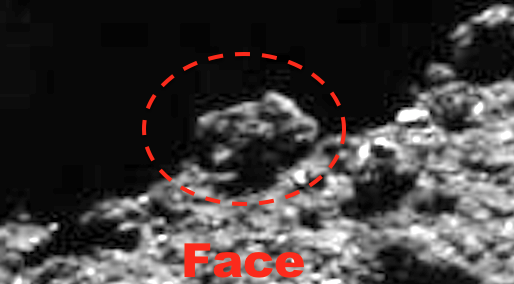 UFO SIGHTINGS DAILY: Faces Found On Comet P67 That Show Many Species Cooperating, Aug 2016, UFO Sighting News. Faces Found On Comet P67 That Show Many Species Cooperating, Aug 2016, UFO Sighting News. 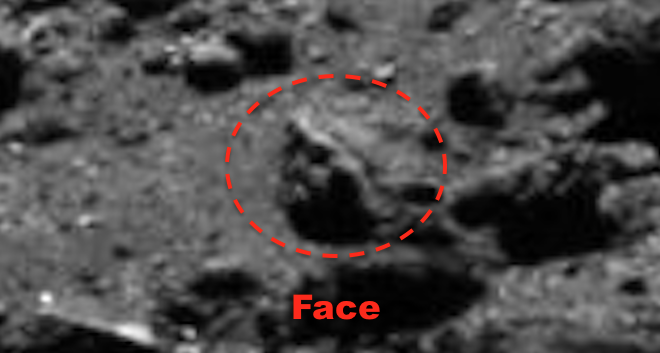 Look closely at the face above...NASA put it into black and white to psychologically mess with how you see it. They don't want you to see the true color or true detail. Look carefully and stop reading here....continue when you see it. What I see there is a large dark face looking up into space. It has long curly hair and beady eyes, a small nose, and thin lips. Its chin looks similar to ours...but its sure as heck is not human. It looks more reptilian than anything. 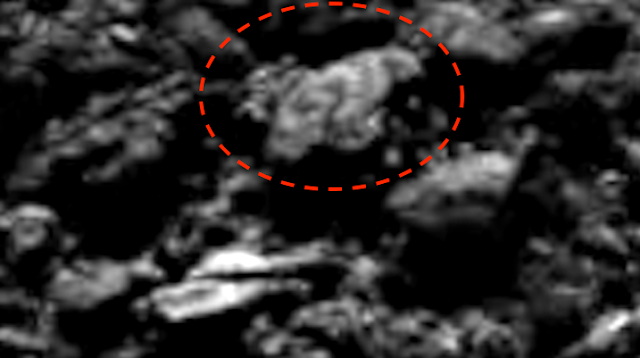 If you can't see it, don't worry, I have searched for anomalies in NASA photos for over 40 years, so I'm use to it...you brain gets adjusted to the black and white photos so color or no color photos all look high detail. Its like...a car accident...you know you should have seen it was going to happen, but it still happened, because you just didn't see it coming. I have four decades of experience at this...I don't expect you to see it easily, if you do, you are one of the few lucky ones. 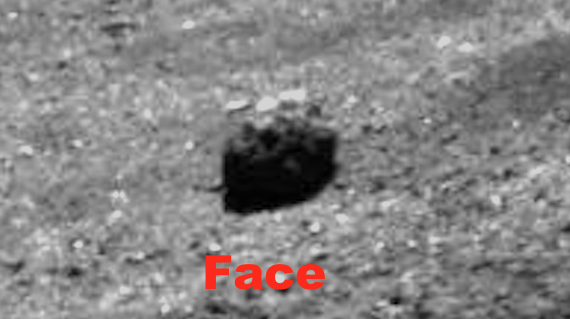 The face at Cydonia...yeah..that was me. Deal with it NASA. Above we see a face with a Sikhs or turban...a hat often used in India due to religious beliefs. Maybe the Muslim religion didn't originate on Earth, but came from a hundred other planets before us. 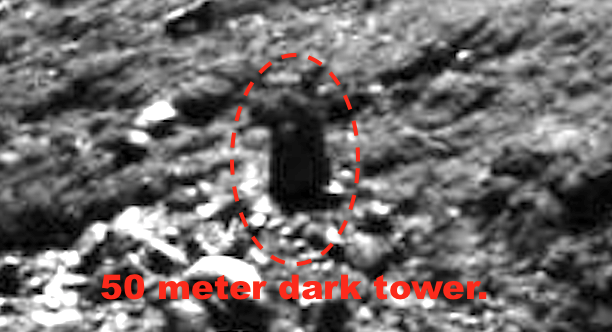 Above is a statue of a person in a cloak. you can see his chest, shoulders, helmeted head, and long flowing cloak that is over 50 meters tall. This is one of the ape like face species. 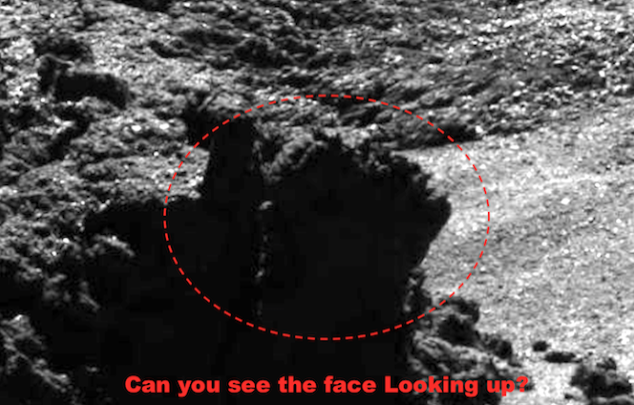 I have found many faces that look like apes or chimpanzees on both Earths moon and Mars, but now comet P67. 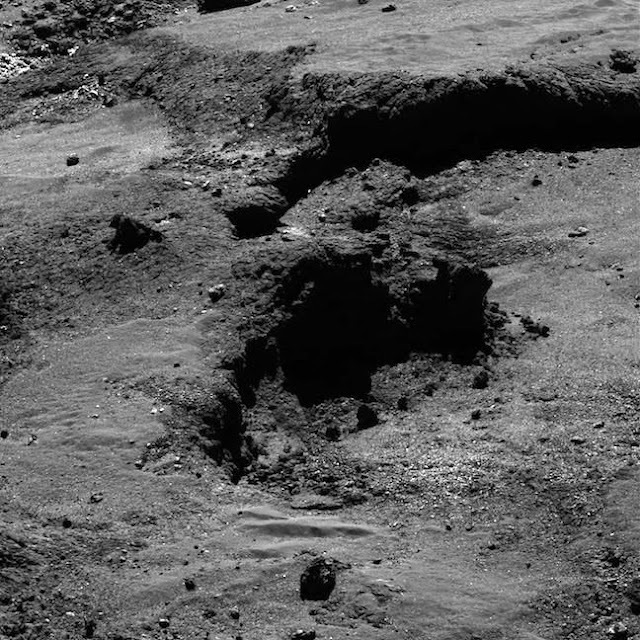 You can see a face here with flowing ears or hair on its right and left side. Its eyes, nose and mouth similar to our own, but clearly is a totally different species...possibly a cat species. Above is my favorite of the faces in this photo which as an evil look to it...almost diablo in appearance.